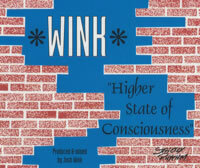 One of the proclaimed "classics" of acid house is Josh Wink's "Higher State of Consciousness". Released in 1995, this one's done its best to try and withstand the obscurity of time with newer remixes from 2007, though the original tends to get the most attention. We're going to go back and see if the original was really topnotch or just another notch in a bed of acid. Looking at the original release, the track was ground out with three different "versions", all by Wink himself. The first is Version 1 - DJ Wink's Hardhouse Mix, but it's definitely more house than hard. In fact, this is a pretty soft and average house tune at best. As a voice repeats the word "consciousness" over and over... and, uh, over, we're treated to a pretty standard house rhythm, sprinkled with a dash of classic 303, and some squiggly acid ruffles. It's not hard at all, though — how dare you lie to me, title? It only gets a little weirder though, as Wink opts to also repeatedly toss a cartoonish "OW!" sample at us, which gets annoying rather quickly. The version is not offensive in any way, but certainly I don't feel the urge to give this a second listen. Second is Version 2 - The 611 Acid Groove Mix. Starting with a pretty thumpy bass drum, soon the sweet sounds of smooth acid nuzzle their way in, and things start feeling warmer. The acid's full strength makes its way in and assures you it's the boss by pushing itself front and center. It eventually steps back a bit for a very distorted voice; it's messed up, and I like it that way. There's definitely more energy in this mix than the last, although its overall sound has aged about as well as cheese on a radiator. Last but not least is the one most fans have heard, Version 3 - Tweekin Acid Funk. Immediately switching to a breakbeat and sliding soon into more distorted vocals telling of a "higher state of consciousness" (just like the song title), it doesn't take long before the main event arrives: that deep buzzing acid, that hard-hitting TB-303... Eventually, Wink takes that sucker into overdrive and punctures our eardrums with high-pitched but nonetheless satisfying squeals of acid joy. Indeed, this is the mix not to miss. But, uh, miss the first one. It's not interesting, and considering it's first, it doesn't bring much confidence with it. The 611 Acid Groove Mix has moments of glory, but seriously, stick with the woofer-singeing Tweekin Acid Funk mix. That one alone will deliver the higher state of consciousness you're looking for. Or maybe it's delirium.